With the demand for 3D-printed models growing, radiologists are likely to find themselves playing a larger role in its use. As the use of 3D models broadens and radiologists work to understand the technology, academic physicians and companies within the imaging and 3D printing markets are joining forces to find solutions that will facilitate the process and identify the most beneficial uses. Yet, those uses still need to be pinpointed, says Adnan Sheikh, MD, medical director of 3D printing at The Ottawa Hospital and an associate professor of radiology at the University of Ottawa, both in Ontario, Canada, who believes 3D models are necessary in "some clinical scenarios. Determining those scenarios is the essential next step." Such determinations, as well as other issues related to 3D printing, are being discussed by both academic and industry activists in the field who are involved with RSNA's 3D Printing Special Interest Group (SIG), Sheikh explains. "This is a unique organization within the membership of the society," he says. "The SIG will focus on maintaining a prominent role for radiologists in this diverse and growing specialty. The group will also seek to provide physicians and allied health scientists with optimized education and research programs," according to RSNA's website. "Activities of the SIG will focus on providing education, increasing exposure of 3D printing and its use within the radiology community, and developing quality standards." In August, the SIG and the FDA's Center for Devices and Radiological Health met in order to "identify current best practices, levels of benefit [vs] risk for different intended uses, and gaps in clinical evidence needed to perform effective regulatory review of [3D] Models," per the FDA's website. The results of the discussions will be released in a white paper, according to the FDA. Issues presented in the paper will include "discussions concerning the benefits and risks of anatomic models based on use, technical considerations that inject uncertainty and variability, best practices for safe and effective production of anatomic models, and knowledge sharing," per the FDA. "Within the radiology world, a small fraction, at present, have direct experience with 3D printing, but that interest is growing," says Mike Gaisford, director of health care solutions at Stratasys, a 3D printing company that announced a partnership with Philips at RSNA 2017. "Interest in 3D modeling for health care continues to grow as health systems see the value of its integrated workflows in areas such as surgery planning, education, and training," adds Boaz Pal, former senior product manager for Philips' IntelliSpace Portal 10 and ICAP. "The printing of 3D models has always been fascinating, but now it has matured into a necessity." At present, "3D printing helps surgeons better understand the surgical anatomy in complex cases," Sheikh says. "This helps surgical precision, helps reduce intraoperative complications, and helps reduce procedure time." Pal adds, "3D printing provides the physicians with an additional view and strengthens anatomical knowledge, which could increase clinical impact while reviewing complex multidisciplinary cases." The technology also plays a significant role in teaching basic and clinical medicine, Pal notes. "This innovative, simulation-based educational approach can create a novel opportunity to stimulate interests in different fields, extend medical knowledge like understanding the anatomical structures of tissue, and provide additional practice methods to improve experience of clinicians," he says. Pal says 3D models also provide a good visual representation when clinicians have to explain anatomy and pathology to patients and their family members. "Explaining therapeutic approaches and techniques by visualization can empower the patient and can contribute to the overall patient experience," he notes. In the musculoskeletal realm, 3D models help plan and guide surgery and are useful for creating custom-made implants such as prostheses and orthoses, according to Marcelo Bordalo-Rodriguez, MD, PhD, director of radiology at Orthopedic Institute of the University of São Paulo Medical School and head of musculoskeletal radiology at Sírio-Libanês Hospital, both in Brazil. "[3D printing] offers a palpable replica of bone anatomy in a 3D scale, and rotational deviations and deformities can be analyzed in real scale," says Bordalo-Rodriguez, who spoke on the topic at RSNA 2017. Interest in 3D models is building as 3D models become more true-to-life in look and texture. "The material used to make a model is related to the kind of technology used in the creation of the 3D prints," Bordalo-Rodriguez explains. He says the technologies utilized the most are fused deposition modeling (FDM), inkjet, stereolithography (SLA), and selective laser sintering (SLS). "[FDM and inkjet] have a lower cost and use only polymers, eg, plastics. [SLA and SLS] have higher costs and use polymers; metals, eg, titanium; and thermoplastics," he says. When selecting materials to be used for a 3D model, new users will experience a learning curve, Gaisford says. "There is no one-size-fits-all routine; however, as users gain experience, they come to realize what material and color combination will be most constructive for the clinician," he says. Each year, an increasing number of radiology professionals undergo training for 3D modeling at hands-on workshops offered at RSNA by Materialise, a provider of 3D printing services and software solutions, according to Bryan Crutchfield, vice president and general manager of Materialise North America. (This year's workshops were directed by Sheikh.) The workshops, which utilized Materialise Mimics inPrint software, served "to give attendees a firsthand experience with 3D printing technology," according to Crutchfield. Touching on the benefits of using 3D models within and outside of the musculoskeletal department, Bordalo-Rodriguez believes 3D printing enhances a physician's understanding of complex cases and can deepen the patient-physician relationship "as it deepens patients' insights into their disease." With such benefits in mind, imaging and printing companies have joined forces to make the process more efficient. "To increase the adoption of 3D printing in health care, clinicians will need more familiar tools built directly into the radiology workflow. That, together with printing service integration, will streamline the end-to-end process," Pal says. "Philips is collaborating with two leading companies, Stratasys and 3D Systems, to complete the flow by providing the best-quality printing services. Through interfacing with our IntelliSpace Portal 10, Philips customers will now have a virtually seamless connection with both 3D Systems and Stratasys solutions to expedite 3D printing." Philips IntelliSpace Portal 10 features an embedded 3D modeling application for creating and exporting 3D models into the clinical workflow, Pal explains. "The 3D Modeling application batches files for easy export in standard formats such as standard tessellation language [STL], and includes the generation of 3D PDF files for better communication in the department and with 3D printing services with files physicians may choose to annotate for further processing," he says. 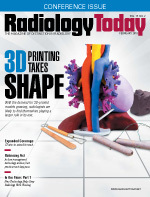 "It is really about streamlining the workflow and increasing the accessibility of 3D printing for all radiologists, whether you are at a hospital that has a 3D printer or not," Gaisford says. "Customers of Philips' IntelliSpace Portal 10 will now be able to access 3D prints directly from Stratasys rather than having to invest in a 3D printer and learn how to set up and operate the printer." Stratasys also has an agreement with Vital Images, Inc, whose Vitrea Advanced Visualization software provides multimodality automated segmentation tools to generate 3D models from DICOM 3D data sets. Vital Images and Stratasys have collaborated to create 3D printing packages that contain Vitrea software and 3D printers that allow customers to more efficiently implement 3D printing initiatives, Gaisford notes. "Stratasys definitely sees the role that the visualization and imaging companies will play in 3D printing. It is really important because they're going to streamline the process of creating patient-specific models," he says. In other industry news, Materialise and Siemens Healthineers have partnered to make Materialise Mimics inPrint software a "dedicated solution for printing anatomical models in hospitals, available to radiologists through the Siemens Healthineers' syngo.via open app platform," according to a release. "This enables the longstanding Materialise software to enter the clinical arena in a more streamlined fashion," Sheikh notes. "At present, all major medical centers that engage in advanced 3D printing rely, day to day, on Materialise products for segmentation and refinement of STL files for medical modeling." "We wanted to collaborate in order to expand access to 3D printing software offerings in hospitals," Crutchfield says. "One challenge that has arisen with the increase of 3D printing is ensuring hospitals have access to the technology and are able to integrate it into their operations. Our partnership with Siemens provides a more streamlined and efficient way for hospitals to adopt and implement 3D printing within their existing workflows." Taking the 3D printing process a step further, researchers at the University of Minnesota have built their own 3D printer and produced 3D models that they claim are unprecedented. Using MRI scans and tissue samples from the prostates of three patients, the team tested the tissue and created "customized silicone-based inks that can be 'tuned' to precisely match the mechanical properties of each patient's prostate tissue," per a press release about the research. The models are fitted with soft, 3D-printed sensors that make it possible for the team to gauge a model's response to compression tests and the application of surgical tools, according to the release. Kaiyan Qiu, PhD, lead author of a paper on the research and a mechanical engineering postdoctoral researcher at the university, detailed the results for Radiology Today. "This work is unique in two main aspects. First, besides the geometry and the anatomical features of the organ being patient specific (which has also been previously shown via other 3D printing technologies), the composition of the material used for 3D printing has also been customized to accurately and quantitatively match the mechanical and optical properties of the patient's prostate tissue. This will allow for a more real tactile sensation and organ physical behavior prediction. "Second, we integrated soft sensors on the organ model to collect quantitative feedback from organ and tissue handling via surgical instruments," he continues. "This metric is an indicator of surgical performance and can provide important feedback for physical trainers or simulators. This feedback provides medical professionals with the ability to quantify and control the force ranges [applied] to the organ during preoperative rehearsal and training." According to Qiu, the 3D-printed soft sensors can be conformally integrated on the 3D-printed organ models. "As far as we know, our 3D-printed organ models are the first to quantitatively and accurately mimic the mechanical and optical properties of patient-specific organ/tissue to provide real tactile sensation and organ behavior predication for surgeons," he notes. "In addition, our models are the first ones with conformally integrated 3D-printed soft electronic sensors to provide quantitative feedback of applied pressures during surgical handling." The researchers were unassisted when they built their printer, Qiu says. "We built our own 3D printing system based on our expertise and experience. We didn't team up with any 3D printing or imaging companies," he says. "Depending on the nature of our future projects, we may team up with related companies in the field." The research was published online in Advanced Materials Technologies in December 2017. "Our learnings from this work will facilitate the direct integration of 3D-printed electronics into the fabrication process of organ models for multidimensional feedback and dynamic functionalities," Qiu says. Looking ahead, it will eventually be possible to print biological materials. "Biological 3D models can be created using cell-seeded structures and biocompatible materials for paving the path for future biological organs," Qiu says. Sheikh adds, "A race is on to create 3D models with materials which better emulate human tissue." As the use of 3D models expands, so will the radiologist's role in their production and use, according to those in the field. Sheikh reports that more than 100 academic centers in North America are currently involved in 3D printing, and most of them are led by radiologists. "Radiologists are in a unique position," Sheikh says. "DICOM images from CT and MRI are required to create an STL file, which gets recognized by 3D printers. Radiologists understand anatomy and pathology in the CT and MR images better than any physicians; they can help better segment the anatomy required to create an STL file." Crutchfield agrees that radiologists have a growing role in 3D model printing. "Radiologists have a unique opportunity to utilize 3D printing software and services to benefit their patients and their practice, as well as to expand their roles within hospitals," he says. "By leveraging our 3D printing solutions during both the imaging stage with software like Mimics and the production stage with 3D printed anatomical models, radiologists can take their traditional imaging techniques to the next level to improve accuracy for their patients and better communicate with both patients and other clinicians." Bordalo-Rodriguez agrees that 3D model printing will expand the opportunities for radiologists. "The main roles of the radiologist [in 3D printing] are to ensure anatomy accuracy—editing image segmentation and sculpting anatomy of interest—and to define clinical applications," he says. "3D printing is here to stay," Pal says. "We believe we will see more and more regulation and guidelines for printing, together with standardization. Common tools will be more automatic, supported by intelligence like machine learning, providing the clinician more options to create more precise models in less time."